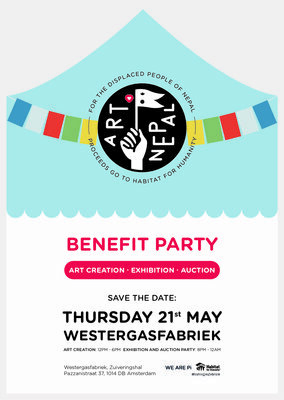 Pi Society & Habitat for Humanity unite the Amsterdam Creative Community with an Art Benefit for Nepal on Thurs 21st May at Westergasfabriek. Art Nepal is uniting the creative community to benefit Nepal emergency housing development. It is being held on Thursday 21st May at Westergasfabriek. Art creation times: 12:00-18:00, Auction/party times: 20:00-00:00. Art Nepal is organised by Pi Society, for Habitat For Humanity, with the help of the creative businesses of Amsterdam. Get involved sponsoring an art canvas by emailing: theartnepal@gmail.com. Amsterdam 15th May, 2015 – Pi Society and Habitat for Humanity are proud to announce another collaboration, Art Nepal, that will raise funds to build houses for those in need after the devastating earthquake that took thousands of lives in Nepal last month. After the second powerful tremor this week, giving is in great need for organisations like Habitat for Humanity to act with our support. Evolving from historic Pi Society events, the Art Nepal format has a special emphasis on putting creative businesses and brands in the spotlight and championing creativity for good. For every tax-deductible donation of 500 EUR, each company will receive a large canvas of which their most talented artists, designers and other creative minds are invited to adorn. 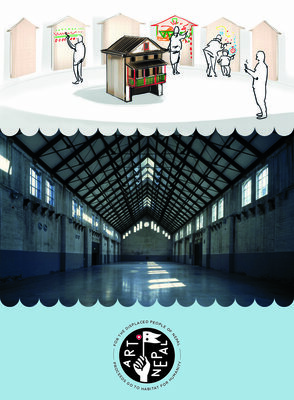 The art creation takes place in the day from noon to 6pm (open to the public), while the finished canvases will be auctioned off at the party that night from 8pm to midnight at the stunning Westergasfabriek. So far, Art Nepal has received commitments from agencies such as 72&Sunny, 180 Amsterdam, WE ARE Pi, Iris, Sid Lee and Weiden + Kennedy. Brands such as Coca-Cola and Broeski, and many more sponsorship talks are currently underway. The DJ line-up includes popular, local talent like $olo, SirOJ and Breach. Joy of the Chiquita Photobooth will also be on hand to capture the fun with her camera, fun sets and hand-designed props. Pi Society is the Ideas Community division of Ideas Company WE ARE Pi, with an emphasis on uniting the creative community for good by harnessing creativity to positively impact the world. Pi Society partners with organizations including TED Conferences, Singularity University and Habitat For Humanity to deliver real solutions. In Amsterdam, previous Pi Society benefit collaborations with Habitat For Humanity have included Love Haiti, Ai Nippon and Art Filipino, which together raised over 55k to build houses in disaster struck regions. The most recent event took place in winter 2013 to benefit the typhoon in The Philippines. Hundreds of businesses including restaurants, fashion labels, fitness centers, musicians, DJs, artists including Shepard Fairy and Florentijn Hofman contributed and this year’s event is expected to have a similar response. Habitat for Humanity is a nonprofit that builds with people in need regardless of race or religion. Habitat For Humanity has helped more than 1 million families improve their living conditions since our founding in 1976. Habitat builds, rehabilitates and repairs simple, decent houses with the help of homeowner families, volunteer labor, and donations of money and materials. Habitat is currently working with governmental and other non-profit organizations in Nepal to gain access and rebuild in regions that have been seriously affected by the two recent earthquakes.